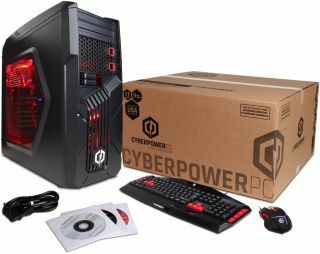 Three months ago AMD and CyberPowerPC announced a joint collaboration that would have the latter build an Oculus-ready gaming PC around the former's hardware, and sell it for $499 when purchasing a Rift headset at the same time. If you've been waiting for that relatively low-cost PC to appear, it is now available. "Today AMD, Oculus, and CyberPowerPC are delivering on the promise made at Oculus Connect 3 with the immediate availability of the Gamer Ultra VR Desktop PC. Affordable VR gaming is now a reality thanks to a wildly low $499 price tag when bundled with an Oculus Rift through our retail partners Best Buy and Amazon.com," AMD stated in a blog post. At the time of this writing, only Best Buy appears to be carrying the specially priced Gamer Ultra VR system. AMD provides a link in its blog post to the system's listing on Best Buy and not to Amazon just yet, and a manual search at Amazon did not yield any results. In any event, the Gamer Ultra VR pairs an AMD FX 4350 CPU clocked at 4.2GHz with a Radeon RX 470 graphics card. Other specs include 8GB of DDR3 memory, 1TB hard drive (7200 RPM), DVD burner, and gaming peripherals (mouse and keyboard. The system is shoved into a gaudy case that looks like it is made from plastic. AMD and Best Buy list the system as having three USB 3.0 ports and seven USB 2.0, and we assume there is HDMI connectivity. While not a barn burner by any means, the specs meet the minimum requirements for Rift, which Oculus lowered in November of last year to account for a technology called Asynchronous Spacewarp (ASW). Whereas the original requirements took in account needing to run games at 90 frames per second, ASW enables a similarly smooth performance on machines capable of 45 frames per second. "The hardware requirements for ASW are modest. This functionality has been enabled on all current-generation AMD GPUs (RX 400 series) and previous- or current-generation Nvidia GPUs (GTX 900 or 1000 series)," Oculus said at the time. Note that the $499 price tag requires that you purchase a Rift headset at the same time. That brings the bundle price to $1,100. If that's of interest, go here to check availability in nearby Best Buy locations.